In the debt-ceiling debate Republicans are holding the country hostage again, demanding that the country shift to a radical pro-big-corporate/big-wealth agenda as the ransom. At the same time the Tea Partiers say don’t raise the debt limit, period, and let the country default, hoping that out of the resulting chaos and desperation they can rebuild the economy in an Ayn Randian, rule-by-the-rich vision. Either way, this is a radical, unprecedented attempt to redefine our form of government, largely privatizing for a few the wealth of We, the People while stifling our voice. If we give in to this extremist vision of cut and gut, America will lose the engine that made us prosperous. So are Republicans doing this on purpose, to tank the economy, improving their 2012 election chances? I obviously can’t read the minds of GOP policymakers, but it seems at least worth talking about whether they’re prioritizing the destruction of a presidency over the needs of the nation. Early this month Henry Blodget asked Are Republicans Intentionally Sabotaging Economy For Political Gain? Click through for the video. It’s about time the Democrats started saying openly what has been clear for months or even years now—that as long as economic recovery would work to the political benefit of Barack Obama, the Republicans have been, are, and will be in favor of sabotaging the economy. [. . .] Today’s GOP is about ideological maximalism on all fronts. … They cannot negotiate, because negotiating means accepting something you don’t like, which the noise machine will not permit. And worse, because the noise machine wants Obama to fail and is so powerful, Republican office-holders inevitably arrive at that point too. … they hide their political motives behind rhetoric about the deficit. It’s high time the Democrats started pulling back the curtain. 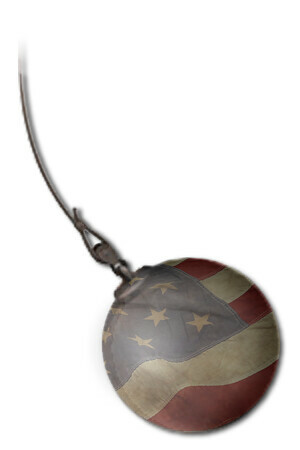 On the longer term, Republican radicals are advocating “a wrecking ball agenda” that cuts the very things that made us prosperous: infrastructure, education, scientific research as well as the things the define us as a caring people and enable all of us to pursue our dreams: retirement security, health care and a social safety net. The cuts mean lower taxes for the wealthy and less supervision of the practices of their giant corporations. Privatization of public wealth and functions means a wealthy few benefit and receive economic gain instead of We, the People. Look at their great leader, Grover Norquist. This guy, he has proudly said on the record that he wants to shrink America’s Government down to the size that he can drown it in a bathtub, he wants to drown America’s Government in a bathtub…who talks like that? But their contempt for America’s Government perfectly matches their plan for the American people. Paul Ryan’s budget would knock out more critical American infrastructure that our sworn enemies ever dreamed of knocking out. These massive cuts wouldn’t just kill Medicare, as the states and cities adjusted to all that, states and cities would wind up sitting down first responders. “I think the president can be defeated if conditions in November of ’12 are anything like they are today. … The single most important thing we want to achieve is for President Obama to be a one-term president,” he told National Journal. This weekend Rep. Michelle Bachmann says that under no circumstances would she vote to increase the debt limit, instead allowing the country to default and economy to be destroyed. Announcing her candidacy for President she says that warnings of consequences if the government doesn’t raise the debt limit and defaults are just “scare tactics,” saying the Treasury can still pay interest. The rich are “job creators? Actually, “The Rich” Don’t “Create Jobs,” We Do. As I wrote the other day about the story of America: We fought a wealthy powerful few who had all the say and didn’t let us have a say. We won and made a country where We, the People made the decisions and share the benefits. So because we had a say we built up a country with good schools, good infrastructure, good courts, and we made rules that said workers had to be safe, get a minimum wage… we protect the environment, we give out social security. We take care of each other. This made us prosperous. The current Republican Party is fighting our form of government, with China as their “business-friendly” ideal. They want to defund through tax cuts and dismantle through spending cuts the things democracy entitles us – We, the People – to, and sell off our common wealth for the private gain of a select and wealthy few. Just what does it mean to take an oath to defend the Constitution against all enemies, foreign and domestic? Let’s look to another time when the country was under attack from within. In April of 1861, a time of uncertain and shifting loyalties, President Abraham Lincoln ordered all federal civilian employees within the executive branch to take an expanded oath. When Congress convened for a brief emergency session in July, members echoed the president’s action by enacting legislation requiring employees to take the expanded oath in support of the Union. This oath is the earliest direct predecessor of the modern oath. Then as now the country was under attack from within. Those still loyal to the Constitution insisted that officials take an “Ironclad Test Oath” swearing they had never engaged in disloyal conduct. The difference is that then they enforced it, and those who took the oath falsely were prosecuted for perjury. Today, not so much. The Fourteenth Amendment of the U.S. Constitution, Section. 4: The validity of the public debt of the United States, authorized by law, including debts incurred for payment of pensions and bounties for services in suppressing insurrection or rebellion, shall not be questioned. Eric Hunt contributed to this post.